Under the proposed Fair Share Reform, almost all taxes are based on income & wealth - the two best measures of how much each household has profited from services governments provide. Only income and wealth that are needed to “get by” are untaxed or taxed at a reduced rate. The reform cuts thousands of dollars off of each working-poor and middle-class family’s total tax bill each year and everyone pays their fair share. Every household pays federal, state & local taxes, & contributes to any war effort. Your one-page combined federal-state-town tax return would take one hour for you to fill out. - NO other adjustments, deductions, or exemptions! Owners & shareholders of businesses & corporations taxed 20% on US-portion of all profits (details follow). Effective rates (family of three): 3% on $20,000; 10% on $65,000; 15% on $140,000; 20% on >$20,000,000. There is a minimum tax of $100 per year for every household. This Income Tax totals 63% of federal revenue. wealth is a deemed 20% tax on average capital gains of 5%. This tax is paid once a year and replaces current capital gains taxes, estate taxes, property taxes (see#5). Effective rates (% of net worth - typical family): 0% on <$800,000; 1% on $1.6mill. ; 2% on >$32mill. This Net-worth Tax totals 25% of federal revenue. $10,000 to $10,600 during any year the nation is at war & two years thereafter. Minimum tax $50 a yr.
e.g. cigarettes, gasoline. Partly prebated for the very poor. Totals only about 8% of federal revenue. -Corporate Taxes - Instead profits are largely distributed to corporations’ owners & shareholders and then taxed as income. 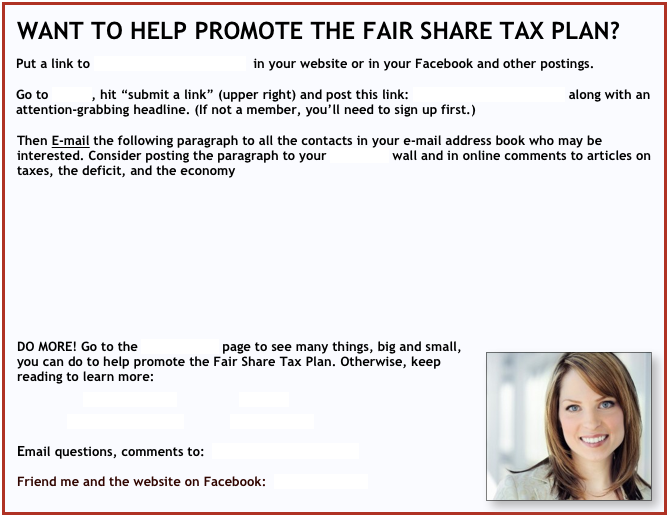 CRITICAL PAGES: HOME ROMNEY TAXES SUMMARY HELP SPREAD THE WORD!. WHAT IF EVERYONE PAID THEIR FAIR SHARE? IF WE FIXED OUR TAX SYSTEM, EVERYONE, INCLUDING THE WEALTHY, WOULD BE BETTER OFF. READ ON TO SEE HOW. Mitt Romney would have his Total Tax Rate (direct and indirect; federal, state, and local combined, including any corporate taxes) increase from his current rate of 14% to a Fair Share Rate of 36% of his estimated $36 million investment gains and income. That would leave him about $23 million in annual investment gains and income to live off of and to reinvest to "create jobs." Link: Why the wealthy should want to pay the extra taxes in this proposal. Under this Fair Share Tax Reform a family of four with both spouses working and total wages of $73,000 would have their Total Tax Rate (direct & indirect; federal, state, & local combined) cut from their current rate of 39% to a Fair Share Rate of 20% of their wages. This would put an extra $13,000 in their pockets each year. They could use it to pay down debt, improve their standard of living, save for college, and invest in their tax-free education-retirement accounts (and so become "job creators" as well as "job doers"). Go to the “Four Taxpayers” page to see the calculations. Almost everyone could complete a one-page tax return for all their taxes in under one hour. The calculations are so straightforward, it would be easy to see that everyone was playing by the same rules and paying their Fair Share. If everyone pays their fair share, the poor and middle class would pay much less in taxes .. The economy would flourish - benefiting the poor, the middle class, and the wealthy. Tell me what you think - see contact at bottom this page - I respond to every message!! TOTAL TAXES that Americans of different classes pay. Federal income taxes account for only 30% of all the taxes we now pay. Add in Social Security taxes, state income taxes, sales taxes, gas taxes, property taxes, indirect corporate taxes, etc. and consider currently untaxed investment gains (as I have throughout this website), and you'll see that the resulting Total Tax Rates paid by the working-poor & middle-class are much higher than those paid by the very wealthy. Our current tax system favors the wealthy investor-class so much that even replacing our entire system of multiple taxes with a flat tax based on income and wealth would make the tax system much more fair (allowing a lower rate only for income below a realistic poverty line, a living wage). The Fair Share Tax Reform proposed here fixes the complicated mess we call our tax system - by eliminating it and starting from scratch. The Fair Share Reform would have everyone pay their fair share, cut working-poor and middle-class Total Taxes by thousands of dollars each year, allow the economy to grow sustainably to everyone's benefit, and balance the federal budget (if combined with reasonable 2 for 1 spending reform). for US policy I have seen in my 73-year lifetime." of Congressional Budget Office during Pres. Carter’s administration. “I am sympathetic to a wealth [net worth] tax in lieu of the estate and capgains taxes ..” -Bruce Bartlett, Economic advisor to Pres. Reagan. READ: Nobel-winning economist Stiglitz in the NY Times (link) - How tax cuts for the wealthy and wealth concentration damages our economy, harming the poor, the middle-class and the wealthy. SPEND 5 MINUTES AT THIS PRIMITIVE WEBSITE! IT WILL CHANGE YOUR IDEAS ABOUT OUR TAX SYSTEM FOREVER.